Good Morning, this is Capital Essence’s Market Outlook (the technical analysis of financial markets) for Monday February 11, 2019. We’ve noted in the previous Market Outlook that: “our near-term work on momentum and price structure suggested that market is in a process of establishing a near-term support plateau. S&P’s 2700 is the line in the sand. All bets are off should the bulls fail to secure this support.” As anticipated, S&P fell as much as 0.9 percent in early Friday session amid a continuation from Thursday’s narrative, which emphasized concerns about growth, trade matters, and disappointing earnings guidance. However, steady buying interest throughout the afternoon, and a last-minute swarm of buyers, lifted the bench mark gauge to a gain of 0.1 percent. The Nasdaq Composite also gained 0.1 percent. The Dow Jones Industrial Average, however, lost 0.3 percent. The CBOE Volatility Index (VIX), widely considered the best gauge of fear in the market, fell 4 percent to 15.72. Financial stocks were under selling pressure Friday as U.S. Treasuries edged higher, pushing yields lower across the curve. The 2-year yield decreased one basis point to 2.46 percent, and the 10-year yield decreased two basis points to 2.63 percent. As such, the Financial Select Sector SPDR ETF (XLF) fell 0.50 percent on the day but is up nearly 8 percent YTD, slightly underperformed the S&P. Now the question is whether recent weakness is a merely a pause that refreshes or it’s a beginning of something worse? Below is an update look at a trade in XLF. Our “U.S. Market Trading Map” painted XLF bars in red (sell) – see area ‘A’ in the chart. 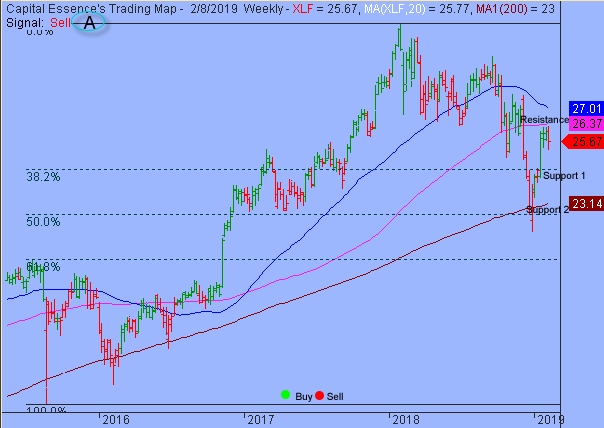 XLF has been on a tear in recent months after the late 2018 selloff found support at the 4-year moving average and the 50% Fibonacci retracement. The January rally tested resistance at the 2-year moving average, a key technical level based on moving averages. Last week’s massive bearish engulfing bar is a clear indication of supply overwhelming demand. This is a negative development and increased the probability for a test of support at the 38.2% Fibonacci retracement, near 24.50. A close below that level has measured move to 23. XLF has resistance near 26.40. Short-term traders could use that level as the logical level to measure risk against. Not much has been changed. S&P continues basing sideways using the important sentiment 2700 mark as support. 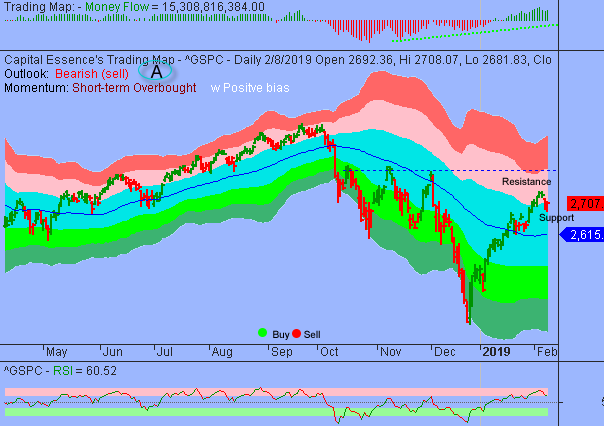 Momentum indicator trended lower but it’s much closer to overbought than oversold zone, suggesting market is due for some kind of a short-term pullback consolidation, the way we had in late January. So it would be a normal, probably refreshing activity to have come down. Perhaps the positive Money Flow measure is the best illustration of the bull’s case. For now, 2700 represents a major price support. A close below it signals a short-term trend reversal and a test of the trend channel moving average, currently at 2615, should follow shortly. Short-term trading range: 2663 to 2743. S&P has psychological support at 2700 while key support is at 2690. A close below 2690 has measured move to 2663. The index has resistance near 2743. A sustain advance above that level has measured move to 2800. In summary, S&P remains in a consolidation phase, which represented the digestion period in the aftermath of the January upswing. While near-term risk skews toward further weakness, the overall technical backdrop remains positive so sell-off should be shallow and quick because the sideline money will try to fight its way back into the market.